Single flowered varieties, mid season or late flowering, flowers with pointed reflexed petals. Stem of variable length depending on the variety. In flower beds, borders, amongst perennials, and as cutflowers. 'Ballade' (violet, white edges), 'Burgundy' (wine-red), 'Ballerina' (orange), 'Maytime' (purple, white edges), 'Pretty Woman' (red), 'Purple Dream' (purple), 'Synaeda King' (red and yellow), 'Tres Chic' (white), 'Maytime' (violet, white edges), 'West Point' (yellow) and 'White Triumphator' (white). The genus's native range ranges from as far West as Southern Europe, North Africa, Anatolia and Iran to the Northwest of China. 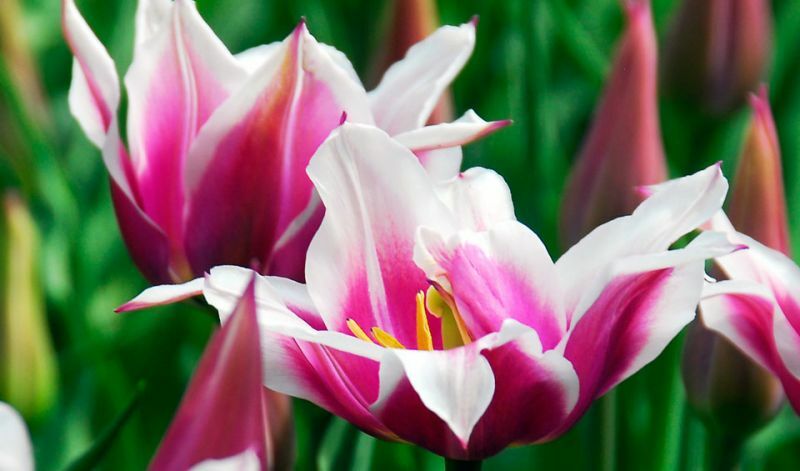 The tulip's centre of diversity is in the Pamir, Hindu Kush and Tien Shan mountains. Although tulips are nowadays often associated with The Netherlands, commercial cultivation of the bulbs and flowers began during the Ottoman Empire. The name is ultimately derived from the Persian 'dulband' (turban). These days it is by far the most popular bulbous plant. Tulips are to Holland what champagne is to France: a national treasure. Cultivated there since the end of the 16th Century, tulips are grown by the billions (capital B) today, with the majority of them being exported either as bulbs or as cut flowers. Currently there are more than 3,000 cultivated varieties registered, with more being added (after sometimes years of hybridizing- and selection-procedures) to replace older varieties or to introduce yet another brand new type or color combination.